The holidays are all about family. I was on the phone with my mother Joyce recently and we discussed family; long before the fledgling children left the nest. My mom is a terrific cook and always put on the fete during Christmas. 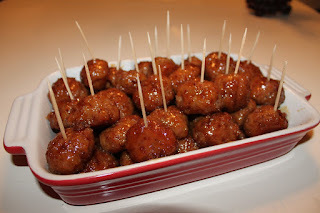 One of my favorite hors d’oeuvres that Joyce is famous for are her Holiday Ham Balls. I therefore dedicate this month’s recipe to my mom. Blessings to one and all. It’s been a while since I’ve cooked something in the slow cooker, so on a recent trip to the Bahamas, I thought that French Dip sandwiches would be a terrific meal. This recipe has only five ingredients and is so simple to make it’s almost embarrassing. Spray the inside of the crockpot with cooking spray. Trim off any excess fat from the brisket and place it in the bottom of the crockpot. In a separate bowl, whisk together the beef broth and onion soup mix and then pour over the brisket. Set the heat on the crockpot to low and cook for 8-10 hours. Remove brisket from crockpot to a cutting board and slice thinly across the grain of the meat. Split the French bread or baguette and pile beef of the bottom half. Cover meat with the sliced Provolone. Butter the top half of the bread and then place sandwich, open-face, on a cookie sheet. Place on the second from top rack in a hot oven and broil for 30 seconds. One of my yacht owners also owns a professional minor baseball team in Sioux City, Iowa. I have been following the Sioux City Explorers all year as they set a league record of 75 wins out of a 100 game regular season; thus putting the “X’s” in the playoffs for their league’s championship. And as a fan, I traveled to Sioux City in September to cheer on our team. This trip gave me the perfect opportunity to put together a mid-west regional favorite. This delicious treat will get rave revues at any Halloween party. Preheat oven to 350 degrees. In the bowl of an electric mixer, or with a hand mixer, beat butter and sugars together for 1 minute. Add egg and vanilla then beat to combine. Add pumpkin puree and sour cream then beat to combine. In a separate bowl, stir together flour, cinnamon, pumpkin pie spice, baking powder, baking soda, and salt. Add the dry ingredients to the wet ingredients in three batches, mixing until just combined before adding the next batch. Drop batter using a cookie scoop onto a parchment paper-lined baking sheet and bake for 10 minutes, rotating the pan half way through. Let cookies cool for one minute on the baking sheet before removing to a cooling rack to cool completely. Once cooled, slice cakes in half. is a 200 ton licensed master and a veteran of the US Coast Guard with over 30 years experience in the marine industry. During this time, he has captained power vessels from 40 feet to 160 feet in length. His professional capacity as an engineer-qualified captain has taken him all over the globe. Skilled in all facets of preventative maintenance; Captain Wampler has a refrigeration-a/c background, water maker operation and maintenance, most all electronic navigation systems including PC based systems, carpentry and varnish. His knowledge is demonstrative of the decades of service he has enjoyed. Waters he has worked include the Adriatic, Alaska, Atlantic, Bahamas, Caribbean, Cuba, Far East, Great Lakes, Gulf of Mexico, Hawaii, Inland Rivers, Latin America, Mediterranean, Mexico, Micronesia, New England, Pacific Northwest, San Juan Islands, South China Sea and the South Pacific. Captain John Wampler is available for yacht delivery, sea trial, acquisition and consultation as well as new owner instruction. Captain Wampler is also an Airline Transport Rated pilot experienced in Learjet as well as Hawker, Citation and Gulfstream jets. Sober, non-smoker, no tattoos.